There are many small lepiotoid mushrooms that look more or less like this one, and identifying them can be quite a challenge. 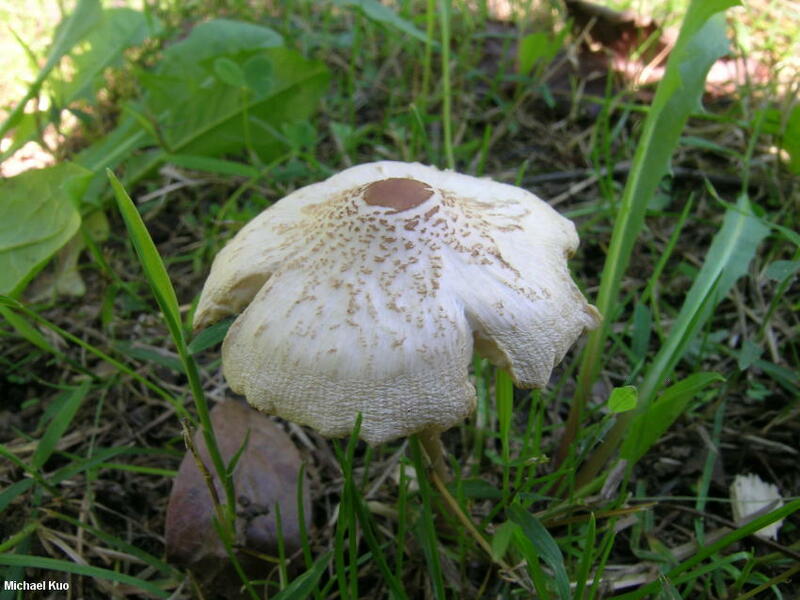 However, Lepiota cristata can be tentatively recognized by its diminutive size, the presence of brownish scales on the cap, the bald stem that bears a fragile ring, and the usually distinctive and fragrant odor. Microscopic features, including bullet-shaped spores and a hymeniform pileipellis, will confirm identification. In a study of cristata-like specimens, Vellinga (2001b) found the DNA of some collections made under redwood and Monterey cypress to be distinct. Of the four genetically distinct groups Vellinga discovered, one redwood-associated cristata-like species from the Mendocino, California area is apparently inseparable from Lepiota cristata on the basis of morphology. 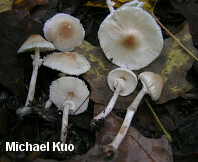 Two other groups, representing specimens found under redwood or Monterey cypress, are not separable from each other but can be tentatively distinguished from Lepiota cristata and the Mendocino species on the basis of their convex (rather than bell-shaped), orangish brown caps; Vellinga applies the label Lepiota castaneidisca Murrill to these groups. 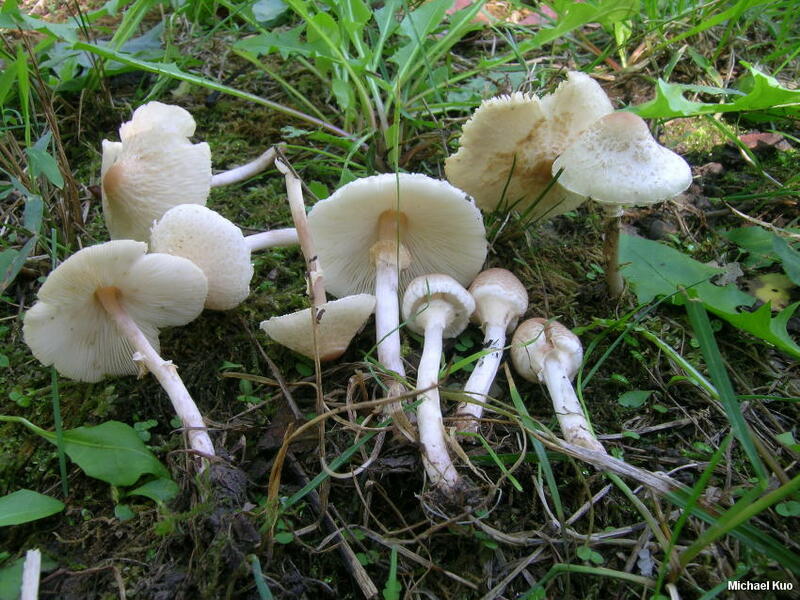 The fourth group was comprised of genetically identical Lepiota cristata specimens from across the globe. Species of Lepiota with bullet-shaped spores have traditionally been grouped together in taxonomic schemes, comprising the "stenosporic" species (often given a section of the genus, Stenosporae). However, DNA analysis by Vellinga (1998, 2003b) does not support the idea that stenosporic species are necessarily closely related. Ecology: Saprobic; growing scattered or gregariously, often in disturbed ground areas like paths, ditches, lawns, and so on, but also on the forest floor under hardwoods or conifers; summer and fall; apparently widely distributed in North America. The illustrated and described collections are from Illinois. Cap: 2-4 cm; convex or obtusely conic at first, becoming broadly bell-shaped or nearly flat in age; dry; bald at first but soon becoming scaly with pinkish brown to reddish brown or brown scales that are usually concentrically arranged; the center typically remaining bald and darker; whitish underneath the scales and toward the margin; the margin sometimes becoming finely lined. Gills: Free from the stem; close; short-gills frequent; white to buff. Stem: 3-7 cm long; 2-3 mm thick; more or less equal; bald; fragile; whitish but often becoming pinkish to brownish towards the base; with a fragile, white ring (which may easily disappear) on the upper portion; basal mycelium white. Flesh: Whitish; not changing when sliced; thin. Odor and Taste: Taste not distinctive; odor sharply fragrant. Chemical Reactions: KOH negative on white areas of cap; negative or yellowish on brown areas. 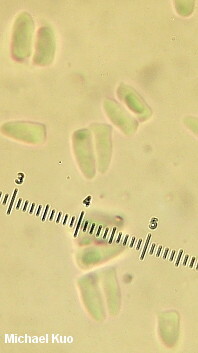 Microscopic Features: Spores 5-8 x 2.5-4 µ; mostly shaped like a wedge or bullet, with a flattened bottom (occasionally more or less ellipsoid, or subfusiform); smooth; hyaline in KOH; strongly to weakly dextrinoid; tending to cohere in groups of two or three. 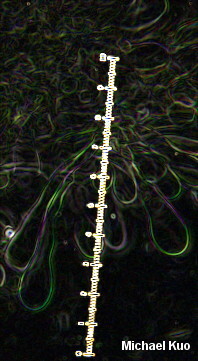 Cheilocystidia 25-50 x 7.5-12.5 µ; subclavate to clavate; hyaline in KOH; thin-walled. Pleurocystidia absent. Pileipellis (over the disc) a hymeniform layer of clavate to pyriform elements about 15-40 x 7.5-12.5 µ; golden to golden brown in KOH. Clamp connections present. REFERENCES: (Bolton, 1788) Kummer, 1871. (Fries, 1821; Saccardo, 1887; Atkinson, 1900; Kauffman, 1918; Kauffman, 1924; H. V. Smith, 1954; Smith, Smith & Weber, 1979; Arora, 1986; Kyde & Peterson, 1986; Phillips, 1991/2005; Lincoff, 1992; Vellinga, 1998; Barron, 1999; Akers & Sundberg, 2001; Vellinga, 2001b; Roody, 2003; Vellinga, 2003b; McNeil, 2006; Miller & Miller, 2006; Kuo & Methven, 2014.) Herb. Kuo 08230203, 10050503, 07140806, 09281102, 09101201.